Farce the Music: Song Premiere / Marley's Ghost / "So Happy I'll Be"
Song Premiere / Marley's Ghost / "So Happy I'll Be"
Got the debut of a great gospel country song for you this afternoon. This'll take you back. It's upbeat, warm, and catchy. 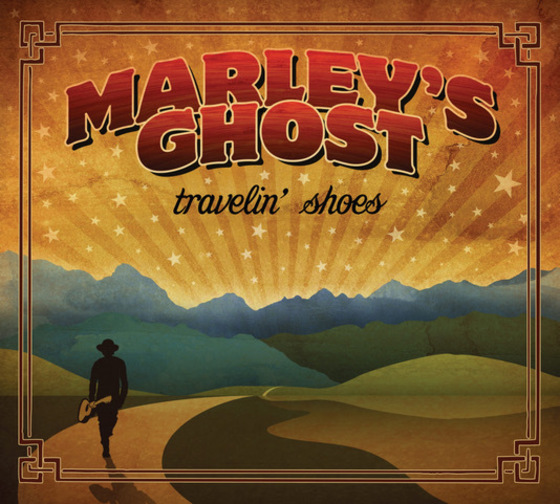 Marley's Ghost will get your toe tapping with a strong shot of harmony and rhythm for the Lord. This is good stuff if you dig Flatt & Scruggs or the Oak Ridge Boys. Their album Travelin' Shoes comes out February 9th. More information about the album and band below the song player! SEATTLE, Wash.—As most people will tell you, there’s an undeniable connection between versatility and variation. Suffice it to say that each depends on the other. In the case of Seattle-based Marley’s Ghost, that eclectic energy has resulted in a broad repertoire that has defied any ability to tag them to any one particular genre. Their dozen albums to date — like the output of The Band— survey a broad scope of Americana and acoustic music in general, refusing to confine them to any singular niche. For their upcoming album, the aptly named Travelin’ Shoes, Marley’s Ghost veers towards a path that doesn’t detract from that overarched umbrella, but instead helps define it further. Due for release on February 8, 2019, the 12-song set offers an assured selection of traditional gospel tunes, each delivered with the rich, dynamic, vibrant instrumentation and tightly locked communal harmonies that have been integral elements in Marley’s Ghost’s m.o. for well over 30 years. Produced by acclaimed virtuoso Larry Campbell (Bob Dylan, Levon Helm), who was previously behind the boards for their highly acclaimed 2016 album The Woodstock Sessions, Travelin’ Shoes is a joyous and surprisingly diverse set of songs, a celebratory salute to the finest traditions of American music. From the compelling, banjo-plucking, back porch delivery of the title track, the crisp, Caribbean flavor of “Run Come See Jerusalem,” and the festive sing-alongs “Hear Jerusalem Moan” and “So Happy I’ll Be,” to the goodtime feel of “Someday” and the upward gaze and chorus of clapping that informs “You Can’t Stand Alone,” it’s an album that will have even the most confirmed skeptics, cynics and agnostics sharing in the sentiment. That dedication to purpose has bound this band of multi-instrumentalists together from the start. 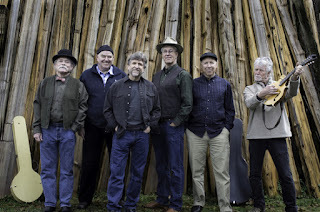 Wheetman, Jon Wilcox (mandolin, guitar, bouzouki, vocals), Mike Phelan(guitars, dobro, bass, fiddle, vocals) and Ed Littlefield Jr. (pedal steel, guitars, bass, fiddle, bagpipes, vocals) have been together since the beginning. Wheetman, Wilcox and Phelan first came together like bluegrass samurai during a fateful week of St. Patrick’s Day shows in the San Fernando Valley in March 1986. Wheetman was living with Wilcox, who brought along his friend, Phelan. The three clicked instantly. It was reggae-minded Wilcox who conjured up the name, offering a nod to Charles Dickens. They reprised the set a couple of months later at the first spring edition of the Strawberry Music Festival, the gathering that became a long-standing California folk music tradition. Given that it was on the verge of branching out beyond the strictly traditional music the festival always featured, it became an ideal forum for the still budding band. That winter, when Wheetman went to record a solo album at the invitation of his friend, Littlefield Jr. (who had built a recording studio on his remote Washington farm, where the group continues to record), he brought Wilcox and Phelan to sing with him on the sessions. Littlefield set up his gear with the band the first night they arrived and the jam session went into the early hours. “When I woke up the next morning,” says Phelan, “Eddie was in the band.” In time, old pal and kindred musical spirit Jerry Fletcher (keyboards, accordion, vocals) and Bob Nichols (drums, percussion) respectively followed suit, officially joining the ensemble and bonding with the others right from the get-go. More than three decades from the initial spark, they’re still playing together with the same passion, purpose and chemistry that inspired them early on. Their combined career has since resulted in a recent series of albums of singular distinction. Van Dyke Parks — he of Brian Wilson and Beach Boys fame — produced 2006’s Spooked, while artist Robert Crumb (the same man who created the iconic cover of Big Brother and the Holding Company’s classic Cheap Thrills album) did the artwork. Jubilee, released in 2012, was produced by the legendary Cowboy Jack Clement and included guest appearances by none other than Emmylou Harris, John Prine, and Old Crow Medicine Show. Their last outing, The Woodstock Sessions, raised the game even further. Naturally then, their efforts have been frequently praised by the press.